Ask and you shall receive; seek and ye shall find. So I’ve been a little lax on updates and am trying to catch up. this post is actually about something I found in Saskatchewan in autumn 2012. My research has involved a lot of digging through pharmacy records. I’ve done some detailed data collection of records from pharmacies in Ontario, Alberta, and British Columbia, as well as less detailed stuff from Nova Scotia. This often involves reading prescription ledgers, or going through prescriptions pasted into big scrapbooks. Depending upon the province, pharmacy laws had different requirements for saving prescriptions. for example, in BC, the pharmacy legislation of the 1890s deemed the prescription to be the property of the customer. Consequently, instead of having to go through prescriptions that were written by individual physicians, with a variety of terrible hand writing styles, we get lovely ledgers written in a consistent and usually highly legible script. Thank you BC legislature! In Saskatchewan I was a little flummoxed because I couldn’t find much in the way of prescriptions, and I wanted to try to be as broadly-sweeping as I could. In finding archival records, the challenge can usually involve getting inside the head of the person who catalogued the records when the records arrived at the archives or library special collections office. To deal with this problem of finding records, we have to go old school. We have to do something that seems counter instinctive in this digitally catalogued age. We have to speak to people. During my research, I was chatting quite a bit with archivists at the Saskatchewan Archives Board site located at the University of Saskatchewan. (The Board has two offices, one in Regina and one in Saskatoon). Archivists are of course a historical researcher’s best friends. Because, as I’ve said before, they have stuff and they want you to use it. (Normally, that is. Some places don’t want you to use it, and that’s an entirely different issue). The archivist suggested I look at records in the U Sask special collections. The contents of this material was not catalogued in such a way that it would be easy to find. But she was pretty sure there was some substantial pharmacy holdings there. The material is catalogued under the name of W C MacAulay, who was Dean of the College of Pharmacy in Saskatchewan from 1946. Looking as I was for pharmaceutical records from the 1800s and into early 1900s, I’d not considered the records of someone who was born in 1909 to be useful for me. But in his position, MacAulay seems to have collected a lot of stuff. It included the following list, from Series VI (in a fonds that is stated to have five series, this can be additionally surprising). W.C. MacAulay Fonds. – MG 43. – [ca. 1884]‑1975 (inclusive); 1921‑1975 (predominant). [textual records + photographs]. – 6.6 m. – M4.1-3. VI. Pharmaceutical Archives. – 1890-1954. – 6 m.
This series contains records, prescriptions, prescription books, ledgers, poison books, log books, and prescription formulae of various early pharmacies and pharmacists reflecting their practises and activities as well as association registers. 1. F.T. Carman – Moosomin, NWT. – 1892-1895. Vols 1-2 – #100-1500 – [ca. 1884-1885]. Vols. 3-6 – #1520-3577 – [ca. 1886-1887]. Vols. 7-10 #3578-6057 – May 28, 1888-[ca. 1890]. Vol. 11 – #8066-9392. – Jan-Oct 1892. Vol. 12 – #9393-B862 – Oct 1892-June 1893. Vol. 3 – #B863-B2277. – June 1893-Mar 1894. Vol. 4 – #B2278-B3729. – Mar 1894-Jan 1895. Vol. 5 – #B3737-B5204. – Jan-Dec 1895. 2. W. Pennington – Moosomin, NWT. – 1895-1946. Vol. 2. – #B8080-19829. – Apr 1897-July 1898. Vol. 3. – #19830-21541. – Jul 1898-June 1899. Vol. 4. – #21542-23271. – June 1899-Sept 1900. Vol. 5. – #23272-25986. – Sept 1900-Oct 1901. Vol. 6. – #25987-27844. – Oct 1901-Oct 1902. Vol. 7. – #27845-29589. – Oct 1902-June 1903. Vol. 8. – #29590-31307. – June 1903-Apr 1904. Vol. 9. – #34607-36174. – Sept 1905-July 1906. Vol. 10. – #41321-43078. – Nov 1908-Aug 1909. Vol. 11. – #23654-24197. – Oct 1935-Aug 1937. Vol. 12. – #245727-266254. – Dec 1938-Mar 1940. Vol. 13. – #266749-268227. – Oct 1941-Feb 1943. Vol. 14. – #59001-59500. – July 1946-Aug 1946. 3. W.L. Carley – Moosomin, NWT. – 1902-1930. Vol. 1. – #12100-19645. – Feb 1902-Nov 1903. 4. J.H. Abercrombie – Togo, Saskatchewan. – 1905-1930. Vol. 1. – Feb 1905-Dec 1915. Note – a miscellany of prescriptions appear on the last few pages of this volume. Vol. 2. – Jan 1916-July 1919. Vol. 3. – July 1919-June 1922. Vol. 4. – July 1919-Apr 1922. Vol. 5. – Jan 1925-June 1930. 5. A.J. Leach. – Togo, Saskatchewan. – 1921-1924. Vol. 1. – Mar 1921-Dec 1924. Note – Includes some scripts from J.I. Wallace of Kamsack, Saskatchewan. 6. J.H. Tripp. – Togo, Saskatchewan. – 1922-1935. Vol. 1. – Apr 1922-Dec 1925. Note – includes some scripts from J.H. Abercrombie of Togo. Vol. 2. – July 1926-Feb 1935. Note – includes a miscellany of scripts from other pharmacies and pharmacists. 7. University of Saskatchewan Pharmacy. – Nov 1953-Sept 1954. Files 1 and 2. – 4001- 4998. – Nov 1953-Sept 1954. 8. Pharmacy Ledger and Log Book. – 1890-1893, 1907-1911, 1933-1934. Daily accounts, Nov 1890-July 1893. Individual client accounts complete with purchases, prescriptions and payments between 1890 and 1895. Vol. 2. – Log Book. #6292 – 9204. – Oct. 1907-Feb 1911. #1000 – 1359. – Apr 1933 – June 1934. Saskatchewan Library records information is the property of the University of Saskatchewan and reproduced with permission. Whose control is it, anyway? So those upstart pharmacists and nurse practitioners want to edge in on doctors’ business! Recently, across the country, various health practitioners have been seeking to expand their scope of practice. This is the legally defined range of activities they are allowed do. In the health system, especially, it is a highly contentious issue. Because unlike other professionals, whose work is also restricted and protected by law, when health professionals do stuff, it affects people’s health. And just ask any health ethicist. Unlike buying a car, or getting your house painted, or even renovating your bathroom, the transaction you have with your health professional affects you in a way that can affect your well being, quality of life, and sense of self. We can understand scopes of practice by looking at history. The scopes of practice for health professionals have been developed over decades, if not centuries. In Ontario, in the middle of the nineteenth century, doctors and pharmacists, argued over what activities should be their specific areas of authorities. Generally physicians won these arguments, since the pharmacy laws which gave pharmacists legal right to compound and distributed a specifically listed set of substances, normally exempted physicians from those rules (docs often carried drugs with them and it was often, in a rural country as ours was, much more efficient for them to sell or give drugs during treatment then to require a patient to head to the local pharmacy). Some physicians exploited this loophole. Some opened their own pharmacies, finding these were much more lucrative than a medical practice. A pharmacy could sell other goods that it might not be so expedient for a physician to carry in his saddle bags, so if you could build a good solid mercantile business, you were in the money. At the same time, some pharmacists also infringed on the physicians’ domain. A customer comes in and has a cough and is looking for a remedy. What do you do? Send them to a doctor to get a ‘scrip for a cough medicine? Or compound some simple syrup, cherry flavour and opium and voila, cough medicine (this would probably be what the doc would prescribe anyway)? Well, to the docs, this was a violation of the legal scope of practice. To the pharmacists, it was just serving their customer. The courts were divided, but most saw selling something to a patient to deal with a simple symptom was not the same as diagnosing and prescribing. There were other issues of intersection, and I’m currently exploring them in more detail. I’ll try to post more information and thoughts when I find more great examples. The point, though, in respect to current debates about scope of practice, is complex. Scopes of practice were contested, debated, lobbied for, and not always established with 100% control. When doctors in Ontario saw the legislation passed that gave them professional status and control over who would be allowed to practice medicine, they had to share this responsibility with homeopaths and practitioners of a few other types of alternative modalities. Homeopathy was popular, especially among elites, and the idea of an absolute monopoly over any single occupation rubbed our laissez faire-ist ancestors the wrong way. But when it comes to drugs, there is another historical process at work: the construction of danger embedded in the prescription. When pharmacy laws were passed they had two purposes. The first was to control access to “poisons” which were being used purposely or mistakenly to kill. Suicides, murders, accidents. These were sometimes linked to drugs. Strychnine, arsenic, opium. These were the poisons. Taken in high enough doses, they’ll kill you. But they were also medicines. So the pharmacy law was designed to place control over highly dangerous drugs in the hands of professionals who knew how to use them. And since usually pharmacists were also compounding remedies (a doctor would send a recipe and the pharmacists would mix it) there was some skill in the actual process of assembling, measuring, etc. But what happens when something becomes controlled? Well, the idea that medicines should be controlled by professionals expands the scope of that control. By the end of the century, there were more arguments for more control over substances that, while not poisonous, might in some ways cause some damage to a patient. The range of “controlled substances” expanded as the pharmacopoeia did. Why is an antibiotic a prescription drug? It’s not likely going to kill you. But if you take it too often, it will become ineffective. How about oxycontin? Well, it is an opiate, so it might kill you, but it will more likely addict you. Both of these, of course, carry their own dangers, and some very significant ones, but they are not poison in the traditional sense. They are, however, controlled. So when docs, nurses, pharmacists and others begin to talk about who should control the prescription and administration of certain drugs, pay attention to the way the idea of danger emerges. What is dangerous? How dangerous? How much risk is there in a different professional administering an antibiotic or a vaccine? And is that danger so severe that the practice should be strictly controlled to one professional? And should one profession have that much authority? It’s worth considering. Because these ideas of danger, control, abuse, misuse, and professional authority are infused with complex meanings. The meanings are historically grounded, and evolve and even transmogrify. As these debates continue, ask what is really being discussed. And then look to an historian to unpack it for you. Last year I was contacted a few times by some AM Talk radio stations after Justin Trudeau made his audacious announcement about legalizing pot. The reason they contacted me was that I am a type of expert on this topic. (Interestingly, they all seem to think I smoke the stuff.) And they all have this tendency to want me to have a strong opinion for or against legalization. Then they want me to make big predictions based upon my research in drug and alcohol history about what might happen if it were legalized. Below I’ve put what I normally tell them. But before that I want to make sure we’re on the same page. Legalization is significantly different than decriminalization. You’d think they’re the same, because if something is not criminal, how can it not be legal? But decriminalization basically reduces the weight of the legal system that comes down on you if you’re found to possess or be smoking pot. Think of it like driving a car. If you speed and are caught, you might get a ticket and a fine, and lose a few “points” on your record. You don’t get a criminal record; you don’t normally go to jail. If you speed, drive recklessly through a city, and smash into a building, you will likely go to court and if convicted, it won’t be for speeding, but for reckless driving, or something more severe. After voters in Colorado and Washington State agreed in a referendum to legalize, not just decriminalize, pot, the states had to create some kind of system of control. This is where I come in. At least in the eyes of the radio stations. Since I study post-prohibition liquor control, and also study drug regulation, the radio station producers and interviewers want to know what it would look like when and if pot were legalized. Wouldn’t it just be like the end of alcohol prohibition? I usually say: not entirely. Alcohol prohibition and drug prohibition have their similarities. Both were made illegal to possess at some point. Both were resisted by a certain group of people. Both were considered by many people to be immoral and a harbinger of social doom. But alcohol was illegal only for a few years, relatively. In the USA, national prohibition was in effect from 1921 to 1933. In Canada, national prohibition began in the First World War, but since it was a provincial matter, prohibition was deployed differently, and didn’t last very long. (Except in Prince Edward Island, which kept prohibition in effect in some form until the 1940s). Although it is true that a massive temperance movement was pushing for several generations to see alcohol as bad, immoral, and a social scourge, the law took a long time to satisfy the urges of the prohibitionists. Pot has been illegal in Canada since the 1920s. It was prohibited under national legislation. It was generally not even very popular until the 1950s, and in the 1960s of course its popularity really took off. A lot of people wonder why it was even made illegal in the 1920s, given that so few people were even using it. Yet its illegality was not just a matter of being illegal or not. Illegality creates all sorts of myths and contexts for a substance. If you want it, you need to conspire with criminals. Criminals need to use certain methods that are sometimes less than savoury to do their business. Whereas other businesses use patents and copyrights to protect their product, criminals might use intimidation and violence. Whereas other businesses, competing in the open market, might try to strategically place their products so as to undermine competitors, criminals might establish their turf and violently remove competitors. At the same time, if you are hooked on it (the addictive nature of pot is highly debatable) criminalization also makes it more difficult to seek help. Because you’re a criminal and ostracized or risk conviction if you admit it. (I wrote about this in one of my first posts, by the way). Criminalization, then, creates a sort of ripple effect of crime and criminality. At the same time, such a system, which is in fact embedded in an underground system of crime, also creates some stereotypes and impressions of immorality. Not only does taking illegal drugs mean, to an observer, that you are now flaunting the law (what other laws might you flaunt?) but also it can be seen as an indication of some kind of depraved moral state. You’re an anti-establishment type, who can trust you? (Of course this works both ways. People who want to be seen as anti-establishment might start smoking weed precisely because it’s anti establishment. I wonder what will happen when it’s made legal). What I should have said was more historically grounded. The short answer is yes. But the longer answer is this: many people who ran hotels or hospitality services of some kind really just wanted to make money. They did it with booze, but when prohibition ended, at least in Ontario (where I do my research), many of these people continued to run hotels, and opened up legal beverage rooms. Some of them had some trouble at first, selling after hours, selling spirits (which weren’t allowed) selling to people who were not allowed to buy it. And I’m sure some of them continued to break the laws. But more of them just began to follow the law. It was lucrative, and even with some pretty tight restrictions on what you could do in a beverage room (couldn’t play music, couldn’t lean on the bar, couldn’t buy whisky, couldn’t go in alone as a man looking to hook up with women unless you came with a woman) many people, for the sake of order, or money making, or just because it was legal, began to do the right thing. It is partly for this reason that I called my book “Try to Control Yourself” because it was about instilling self control on citizens. And it was about asking them to try their best to control themselves. It was not, as some argue, a stalinist state. It was an attempt to control something that was in fact considered very socially problematic, and politically dangerous, too. So in response to the “nefarious characters” comment, I could have given a more nuanced answer: for many people, it was the law that made them nefarious, not some kind of inner moral corruption. When that law changed, they could then profit legally from selling what people wanted to buy. They were no more nefarious than, well, bankers. Maybe even less so. How will legalization of pot unfold? Well, it’s tough to say. But although it might take on the characteristics of early alcohol legalization, there are enough differences, and our society is technically and culturally different enough to create a whole different context for this process. Keep an eye on this. It will be fascinating. I was at a conference in London on drug and alcohol history. I go to these quite a bit. But this time they caught me on video. To avoid seeming entirely self-promoting, I encourage you to follow the links to other interesting presentations at that conference. And just in case you’re wondering, the “James” to whom I refer in the paper, is James Kneale, who presented his paper immediately before mine. His presentation is also on this site, as are many others, and all better than mine, I’m sure. Once in a while we need to get off our butts and get to the archives. I was in the University of Toronto’s Robarts Library yesterday and had the blissful feeling of going through actual real documents, coming out covered with the detritus of over 100 years of deteriorating paper, glue and leather bindings. But after getting through all of those documents (I was deep in historical provincial legislative records) I wanted to look at some of the newspapers for the provinces I’ve been working on. The problem is: I didn’t know which papers existed for the period I was researching. Searching “Halifax newspaper” for example was a poor approach, and yielded weak results. How do you find which newspapers existed, when, and where they are located? It may be a newbie dilemma, but since I mostly did Ontario history for the past 15 years, it wasn’t a big problem for me recently. Although it lists what the LAC has in its holdings, it is possible also to find where some or all of a particular newspaper is located in other university libraries and public archives. 1) Use the search field in the top right of the page and search on the specific name of the newspaper. You will likely get many results, because that search pulls of mention of that title as a phrase in everything. But if you then do an advanced search, search with the name of the paper as a title, and then maybe add a few more limits [for example, date or language or Library vs Archive] you should be able to find a listing for that newspaper. 2) Click on that title and it will go to an old skool looking Courier font listing for the paper. 3) Click the “Locations” button near the top left edge of the page, it will show you which libraries and archives hold it, and the ranges. These libraries and archives are listed by an obscure code (hint: word beginning with “O” = Ontario, “Q”= Quebec, etc. This is normally what is available through Inter Library Loans, so there may be more stuff at the actual library itself. 4) Click on the location in the left column and it will tell you which institution has this paper. With all of the on-line documents out there, it is tempting to avoid the sitting-in-a-library-and-reading-miles-of-microfilms approach to newspaper research, and replace it with using text searches on digital newspapers, texts and other scanned material. There is some merit to that: saves time, microfilms readers can be annoying to use, and you can do your research at home in your underwear. But lest you rely too heavily upon the scanned text, remember one thing: character recognition software can be deeply flawed, especially when it is trying to recognize characters from texts printed over a hundred years ago. 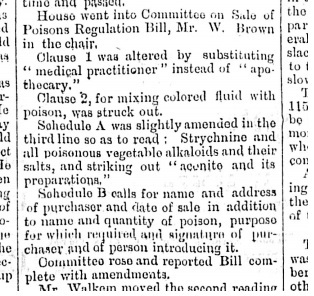 On 18 March, 1881 the BC legislature had a brief discussion of amendments to the 1881 Poison Act. ‘ .l\l1d of person introducing it. Booze is a drug, for my intents and purposes. I’m not going to get into this topic of alcohol versus drugs as far as classification. At least not yet. I just wanted to do a little self promotion. 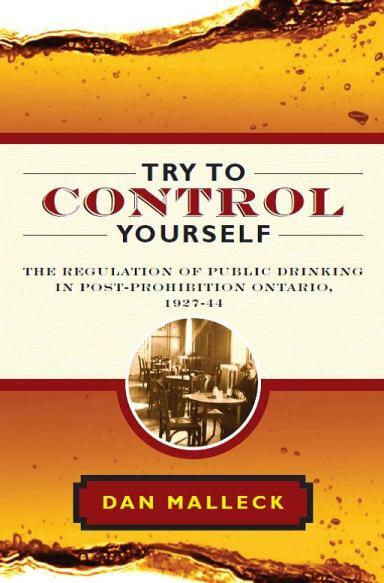 My book, Try to Control Yourself: The Regulation of Drinking in Post-Prohibition Ontario, 1927-1944 has just been released. The best place to order it is directly from UBC Press. It will eventually also be available on Google books, but not on Apple’s iBooks or Amazon’s Kindle because they demanded deep discounts in the price, and the press can’t afford that. Academic publishing is not a for-profit endeavour–it is highly subsidized–so for private companies to expect deep discounts is a little offensive. Google, meanwhile, did not make any such demands. You can also order it through several online sources, such as Chapters/Indigo. Here is a link to the ordering website. Note, a less expensive soft cover version will be coming out near the end of this year.